I love how Heavenly Father gives us little gifts...the one I am grateful for currently is that rhubarb and strawberries grow in the same season. I find it incredible that this happens over and over again within the growing season that things that go together beautifully are ripe at the same time. Anyone that knows me knows I like to experiment in the kitchen. I rarely follow a recipe. I often will look up several recipes of the same thing, look at the ingredients and the processes and then make my own version. I don't know if that is cheating but that is how I work in the kitchen. 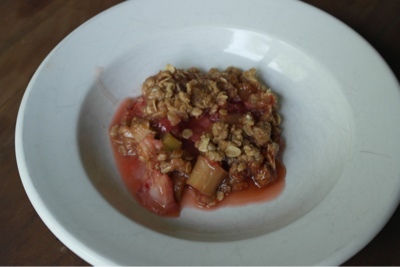 Today I am sharing my version of Rhubarb and Strawberry Crisp and my kiddos left their comments at the end of the recipe...ENJOY!!! Place those 4 ingredients into a 2 quart baking dish and stir in the sugar and flour to coat the strawberries and rhubarb. Place Crisp mixture over the top and place into the 350 degree oven for 35-40 minutes, the crisp should be golden and the juices from the fruit should be bubbling at the sides. If you have picky eaters like I do(I will say it is getting a ton better...perseverance is the key, don't give up) this is a good way to get a new vegetable into them!!! it was delicious because we all helped make it! I love to make crisps, many of my friends did suggest to try out rhubarb and strawberry. I will have to try it out one day.